We are specialised in the export of HGV tyres. This is why we can offer you HGV tyres from numerous manufacturers and in all kinds of qualities. No matter what kind of requirements you have for your HGV tyre - we are positive to have the right one for you in stock. Please send us your request via fax or Email - or simply give us a call. You can reach us at ++49 0160 94 40 21 27 or ++49 171 525 69 64. 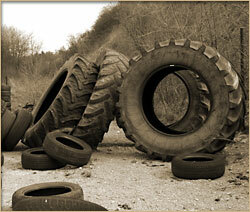 We can supply you with a large range of new and used tyres in all sizes and quantities. Because of our approved and professional storing of our used tyres we can ensure a good quality. During the sorting process we thoroughly check the condition of all tyres to make sure that they are not defective. We will take care of the complete transportation of the goods you ordered. Get in touch with us and order our active sales list! A qualified service team will be happy to assist you. Ask for our current offers.